Yuri!!! 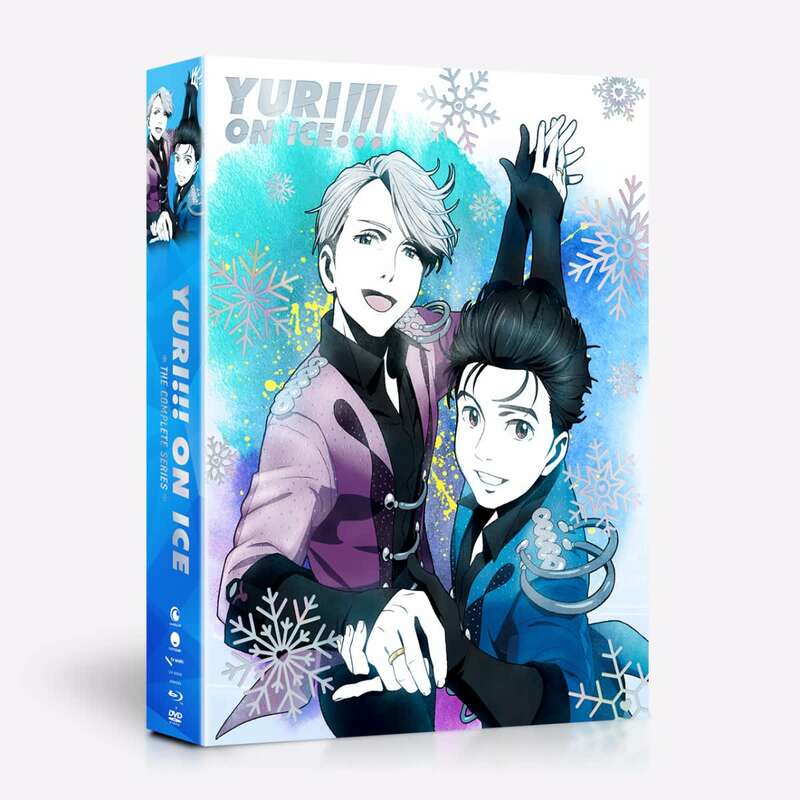 on ICE contains episodes 1-12 plus an 80-page book of illustrations and behind-the scenes interviews with director Sayo Yamamoto, co-creator Mitsurou Kubo, and choreographer Kenji Miyamoto. The set also comes with three art cards and a chipboard collector's box with "cracked ice" holographic finish and silver foil. This packaging is GORGEOUS. The box is iridescent and the first verse of History Maker is printed just inside the lip. The booklet is packed with details on all the skaters and the supporting characters, interviews with the choreographer and creator, and more art including cell sketches. The three bonus cards are a nice thick card stock and were well packaged with a backing board to prevent accidental bends. The packaging is great, I love the art cards (great quality), the art book is super cool, and I like my Yuri button. However, I paid just as much money for this as blu-ray owners and heads up to all; there are NO extras on the dvd set. It's all blu-ray. Extremely disappointed in that. A great limited edition box set! The set came in mint condition. Funimation always does a great job with their sets. The holographic cover is simply beautiful. The blu-rays and disc art look great, especially considering that it is a funimation release that usually has plain discs. The price is reasonable for the product. If you're a fan of the series, you should definitely consider picking it up! Get it Before its Gone!!!!! I'm so happy to finally have this, shipping was horrible since mine got delayed, but guys this is so worth it! The cover is absolutely beautiful and shiny and I love how they used two different artworks on the front and back of the set. The lyrics on the inside was a cute touch :) and it was so nice to see some disc art on both the blu-ray and dvds since sometimes they are plain. The art cards are pretty good quality i just wish i could have more than just 3. The booklet that came with it is well made with beautiful works of art,info, and interviews. Everything fits nicely in the box. I totally recommend this series and this set it was worth every penny!!!! The items are all of great quality, and the artwork is fantastic. The box and case is of a very sturdy material, and the details are excellent. The book, and art cards are very well done, and the disc artwork is some of the most beautiful I’ve seen. My item was also packaged very nicely, insuring safe delivery. I highly recomend you don’t miss out on this set if you are a fan of Yuri!!! On Ice. amazing deal, great quality, BEAUTIFUL ART CARDS! This is a great deal. The art box is lovely and enough with the bluray/DVD pack to make the buy worthwhile. But then it has three high quality art cards and a mini art book too. I just about died of happiness when I got mine. 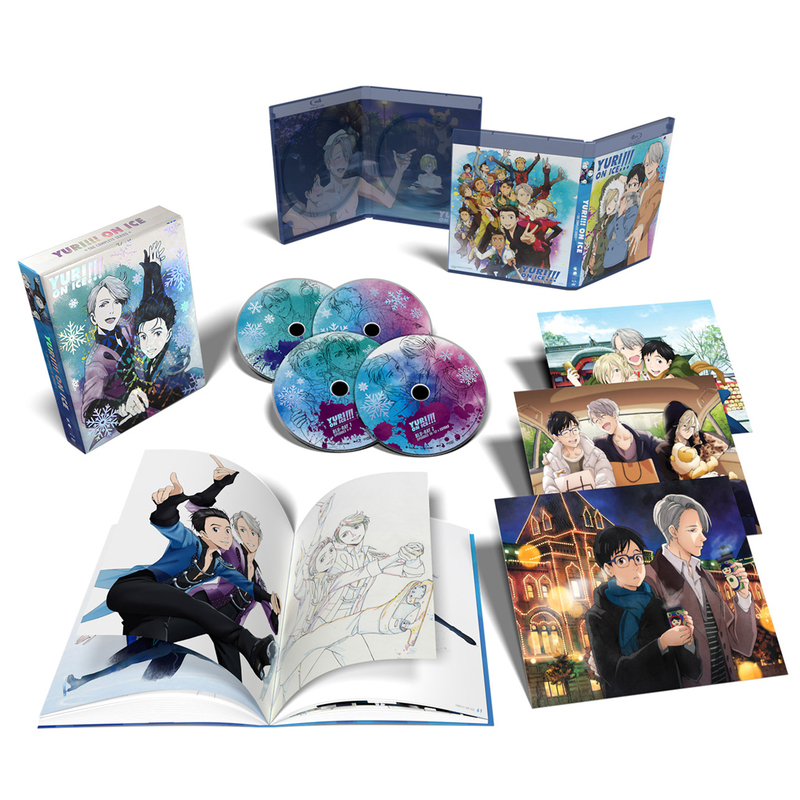 I was worried with the immense popularity of YOI the fans would get taken advantage of when the US release hit, but joyfully this is not the case! I was so happy when I saw this. I ordered it right away. The series is absolutely one of my favorites. The characters are amazing and they have great development. The story line is fantastic and the plot is something you don't see everyday. I loved the box that the disks came in. It even came with a pin with Yuri on it, though that may have been a bonus for pre-ordering it. The limited edition box is absolutely stunning! The cracked ice holo look was a fantastic touch to the beauty of the series and its story. I loved seeing the first phrase History Maker on the inside lip of the box too! The booklet that comes with it is chalk full of great details on the characters both main and supporting to include lots of great tiny bits of how the characters were inspired as well as interviews with the show's creator and choreographer. The three additional bonus art cards were cute and love that everything fits perfectly inside the box it comes in. As these are going out of print soon it is worth every penny spent and I would definitely recommend this product to any fan of the show. I was initially going to buy the standard version of this Blu-ray set. But once I received an e-mail about the limited edition going out of print, I changed my mind and purchased this version. I did not regret that decision. The box that houses the Blu-rays and DVDs is sturdy and nice to look at. The holographic ice and the blue colors give off a winter-like feeling. Inside of the edges of the box are lyrics from the opening. I did not notice those lyrics when I first looked at the box. I found it to be a fun little detail and does not disrupt the look of the box. A booklet is also inside the box, and the paper is smooth and soft. Inside the booklet contains artwork of the series, character profiles and some interviews with some of the staff members. My favorite part of this release is the "Welcome to the Madness" OVA. The animation and the music are outstanding despite the short length. I recommend this for serious YOI fans. This is one of the most beautiful sets in my collection. The art box sticks out so much. The front is extremely sparkly. The art book is nice, generally what you would expect an art book from a set like this to be, and the art cards are a neat addition. The show is good but you aren't reading reviews for the limited edition for the show. If you are a fan I highly recommend this set. It's a small set but that is a plus since the impact on shelf space is less. I loved this anime when I watched it on the FUNimation app and I knew I just have to have the limited edition of it. The LE edition has beautiful artwork with nice goodies like the Yuri pin I got and I recommend it to all fans of the show. FYI: make sure to get this release ASAP as FUNimatiom announced its now OOP and only limited supplies left. The set is absolutely wonderful. It contains an 80-page book that fits inside the box with the disk case. There are 3 art cards with the disk info back factory sealed to the back of the box. The case has reversible cover art. On side has 2 pics and the other is of several of them in the bath. Hope I have helped some of you decide whether this is right for you. Born to make...a case that shimmers like no tomorrow! It has been a long time since I wanted to buy a complete series of an anime, much less a LE box set and I was not disappointed. The entire thing is surrounded with beautiful art from the postcards, to the outer box that had patches of shimmery goodness! It's a great surprise to see the interior with lines from the opening. Although the book has two page spreads with one large image that gets awkwardly sucked into the fold, the book is full of interesting information and splendid artworks. It's obviously more expensive than the normal edition, but it is well worth adding to any anime fan's collection! I love this set. The box is so cool with lyrics from History Maker on the inside rim. The book and art cards are gorgeous. The anime itself is one of my all time favorites. Get it you won't regret it and this is the best version. Yuri!!! On Ice has become one of my all time favorite anime’s so far. Between the anxiety and relationships that happen it really just seems to speak to you. You can understand how the characters feel and you get intament moments with them while they skate and you get to hear their true thoughts. The art in the book is great to look at as well the interviews are awesome to read. If you really enjoyed series I highly recommend this bundle. You’ve read this over and over again but it’s teue GRAB THIS SERIES!!!! The art magnificent, iridescent, colorful packaging. Great colorization for blu-ray. If you’re a fan grab it before it’s too líate, wanting to go into something a tad different without hyperinflation this is the 1! I just love this series, it is perfection from begin to end. That is why I was over the moon excited when I got this limited edition. There is a ton of detail in the set that show this was truly made for fans. The cracked ice on the art box is unique and beautiful, there is even lyrics from the opening in printed on the inside. The artbook is full of interesting articles, character bios and art most have never seen. The artcards are frame worthy as well. The only con of the set is that the extras are all on the Blu-Ray discs. This is a wonderful series and I loved the artbox for this release! While many limited edition funimation releases are similar in their case design, this one is more special. Unlike the standard gloss image on the case, it has holographic areas that is extremely appealing. Little details like the hologram of the snowflakes to even having some of the opening lyrics adorned on the inner box are a great touch and would add tremendous appeal to anyone's collection! I absolutely love Yuri!!! On Ice and was soooo happy that I managed to get one of the last copies of the Limited Edition set since by the time it got to me, the site said it was no longer available! I love the music for all of the skating routines and think the skating was very well done, as well as the story. I also love the extras and the little book and the sparkly box it all came in!